pi-topCEED is a stand-alone learning and education unit based on Raspberry Pi to get started with hardware and software. It consists of a pre-built framework, holding a PCB hub and the Raspberry Pi board, a 14” HD screen, adjustable hinges, and a customizable acrylic slice for easy frontal access. Fitted with magnetic modular rails, you can use any pi-top add-on boards, such as pi-topPROTO. By simply sliding the pi-topPROTO development board into the modular rail it allows you to prototype electronics and add functionality you build into your device, while providing you full access to the Raspberry Pi’s 40 GPIO pins. pi-topCEED comes preassembled with all required software pre-loaded. Since the Raspberry Pi board is not included, it can be purchased in a bundle with 3% discount. 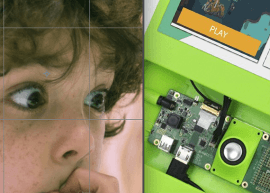 With the free pi-topOS and free CEED Universe educational game, you’ll be able to start learning how to code, create awesome devices, and take your knowledge to the next level as soon as you take it out of the box. Current desktop keyboards and mice are all compatible with the pi-topCEED. Set up your pi-topCEED following our manual so you can log-in and start your own cool projects, play our educational game CEEDuniverse and more!